This website curated by Shellie Tancred, Principal. Attunga PS is amazing. It has been created to support the implementation of the new Australian Curriculum and has a daunting number of wonderful resources covering all KLAs shared by many generous teachers. Please share your experiences with others so that we can let everyone know the best resources found. I have chosen to highlight the Comprehension Snapshot for this term. I'm sure you will find some very valuable teaching resources and interactive activities to include in your literacy sessions. Here is the link to the webpage for our Australian Curriculum resources. It has relevant links to the NSW Syllabus and examples of resources shared by other schools. The goal will be to make this site the depository of our own created resources. You might like to have a look and familiarise yourself with the site so it will be simple to use in the future as we add our own units of work. These examples of multimodal texts may give you some ideas for use in your classrooms this term. Most are suited to use with iPads, laptops and in the Technology Room. All tools and apps are simple to use and the children love using them. They can be used K-6. So why not try one (or even more) with your class in Term 1? This is a rhetorical question!! KidPix and the Beebots are great for literacy and numeracy activities. Here are some ideas for using Kidpix and the Beebot cards that we have at school. 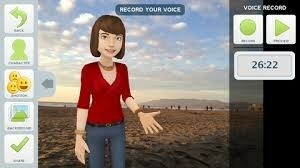 The app TELLAGAMI can be used for speaking and listening as well as an assessment tool. Other apps that could be used in the same way are EDUCREATIONS and SHOW ME. The app image links to info on the app, how to videos and education reviews. It could be used to curate apps you find most useful and share apps you are using in the classroom with the parents on Edmodo, blogs or email. It could also be used as a search engine for you to find great apps for use in the classroom. I will be using it next term to put apps in the newsletter. It is suitable for all ages and would be great for publishing information reports. It incorporates text, images, weblinks and videos and would work well for displaying a variety of childrens' work on blogs and Edmodo.